My wife and I recently part ex'ed our first caravan for a newer model at Highbridge Somerset. The service provided at Highbridge Somerset was exemplary from start to finish from all the departments. We cannot thank Will from sales enough. He was brilliant and nothing was too much trouble. He was helpful from our first phone call and the quality of caravan we bought, when viewed initially, more than lived up to his description he gave to us on the phone and on the web site. We were not pressured into anything and he understood our requirements form the start giving us as much time as we needed. The hand over was brilliant, thanks to Andrew. Everything was explained and demonstrated to us and we were left with complete confidence in what we had purchased. Administration at the end was smooth, friendly and very helpful, again answering any questions we had without any trouble. The shop has a brilliant range of items and all competitively priced, even more so with the 10% discount for customers who had bought a caravan. Quite clearly everyone we encountered really enjoys working at Highbridge with no sales persons competing for your custom but all working together. Most definitely worth the 2 hr drive each way and puts other closer Caravan sales to shame! A big thank you to Will and all the team. After making initial telephone enquiries to Highbridge, my Wife and I travelled 200+ miles earlier this week, to view the range of Hymer caravans on display. We were greeted warmly at reception and quickly introduced to Mike Ford from the sales team. Mike soon proved to be a STAR as over the course of the next day and a half, he spent several hours answering our questions, helping us, guiding us, finding out information for us as well as involving colleagues to clarify some technical matters. Mike gave us time and 'space' to explore the caravans on our own. We didn't feel rushed or pressured in any way - in fact, quite the opposite. He was polite and patient and created a feeling in us that nothing was too much trouble - his time was our time. This was no 'hard sell' but a genuine way of developing a relationship to ensure total customer satisfaction. Mike succeeded in bucket loads! Although we fell head over heels for the Hymer (and recognising all of Mike's efforts and patience), we decided not to buy after all. This was simply because there was too little kitchen worktop space and the entrance door is on the 'wrong' side. Issues we could not live with or overcome. When I called to tell Mike of our decision, any disappointment he might have felt, did not show. 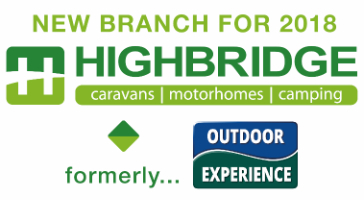 He's a true professional and a credit to the team at Highbridge - thank you again, Mike. And thanks too to Dave for his technical input and Tina as my first point of contact on the phone, several weeks ago. Good morning, Firstly, we would like to thank Michael Ford and everyone involved in our recent purchase of our new to us Swift Elegance. We are so pleased with our new caravan. On such a busy Saturday morning, the time spent with the handover was not felt rushed at all. In particular the time spent by three members of staff trying to get our battery fitted correctly. We would like to point out though, that we did struggle to lower the noseweight of the Elegance before hitching up - eventually by placing nearly everything we had brought with us into the rear of the caravan, this was achieved. Having travelled 120 miles to collect, we decided to stay overnight nearby - thank goodness we did - as we discovered on arrival at the site, that both the onboard water tank and boiler had been left filled. This obviously added a tremendous weight to the nose. Going home on Sunday morning, was completely different, with tanks drained our noseweight was perfect. We also noticed on handover that the camera screen was missing - this was being looked into for us. Do you have any news on when we might receive this yet? We really appreciate all the time spent with us this last weekend and are looking forward to many happy holidays with our caravan. To deal with such a large business can sometimes lose the personal service - but this is not the case at Highbridge. Please pass on our thanks to all.